The First Class Lounge was like an art gallery. Covering the wall space was a mural of eight paintings by Salvatore Fiume. At the focal point of this beautiful lounge was the bronze statue of the ship's sixteenth-century namesake, Admiral Andrea Doria. There he was staring ahead, wearing his armor and cape and resting his hand upon his sword which was half his height. Admiral Andrea Doria watched over the ship until 1964 when the dive boat Topcat arrived with salvage divers. The salvers were Glenn Garvin and Robert Solomon, two real estate businessmen. Neither Garvin nor Solomon were divers themselves, nor did they know anything about marine salvage. But, they had valuable assets other than their own hard earned money for backing: they knew how to delegate work to those most capable of handling it. They started out in 1963 by purchasing a surplus U.S. Coast Guard cutter and renamed her the Top Cat, after the famous cartoon character. The 125-foot cutter was fitted out in Norfolk, Virginia, by the time she was completed, her decks were crowded with winches, motors, compressors, torches and cables, ropes and lines, a ten-ton hydraulic hoist, miscellaneous diving equipment, a recompression chamber, and a diving bell. At Simkins' recommendation, Dan Turner was hired to captain the Top Cat. Besides being a diver himself, Turner had long been a tug captain for Merritt-Chapman and Scott, which was then building the Chesapeake Bay Bridge-Tunnel. Along with Turner came his entire tug crew, including first mate Pee Wee Rose, his brother Pete Rose, and George Merchant, Turner's diving partner and right-hand man. Merchant was an explosives expert in the U.S. Navy. It was not until the summer of 1964 that local divers were hired: Bill Dexter, Joe Paynotta, Paul Harling, and Bob Laverdiere. The boat reached the Nantucket Shoals after a harrowing twelve hour journey, but sea conditions were too severe for diving. The Top Cat wallowed in the foamy troughs for two days before the weather moderated. After a few test dives the Top Cat returned to New Bedford for fuel, supplies, and an exchange of divers. Harling, Leverdiere, and Paynotta returned to their blue collar occupations. In their place came three U.S. Navy divers on leave from the salvage tender Skylark: Johhn Grich, Paul Heckert, and Dennis Morse. They were friends of Merchant from his time in the service; all were trained in hardhat and scuba. Now work began in earnest on the main project. The goal was to recover the life-sized bronze statue of Admiral Andrea Doria from an alcove in the First Class Lounge. Turner laid out the Andrea Doria's blueprints so everyone could study them. He counted the lifeboat davits from the bridge aft, and determined where they would have to enter the hull in order to be above the alcove encircling the statue. The Promenade Deck was incased in glass that once protected passengers from the wind and the spray from the sea; the first chore was to blast out the framework that prevented access to the teak decked interior. The divers smashed out the glass and slung cables through the metal stanchions. The Top Cat's boom took up the slack. The blasting caps that set off the main charges were fired from the surface. Then the frames were hauled up to the deck of the salvage vessel. Dropping down to 185 feet, the divers next laid charges along the superstructure bulkheads separating the rectangular windows that lined the lounge. As each section was blasted free, it was hauled to the surface so the heavy metal fragments would not fall and possibly damage the statue, or later hamper raising operations. In this manner they kept blasting until they created an opening five feet high and eight feet wide. Once the way was cleared, the divers descended into the blackness, dropped down to the centerline of the ship, and turned aft to face the alcove in which the Admiral was supposedly ensconced. Italian fabricators had done their job well: despite the Andrea Doria's position on her beam-ends, the Admiral still stood upon his pedestal; he now lay horizontally, like a sleeping soldier forever clothed in battle dress. He was 210 feet deep. The four navy divers continued going down in round robin fashion, working in teams, and making two dives per day. The hours spent in floating decompression were long and wearisome. They rigged double loops of three-eighth inch stainless steel cable around the statue by passing the end through the crotch, around the back, and choking it off around the neck, then out to a rope that was attached to liftbag that was inflated, but shackled to a lifeboat davit. The tension was taken up so that, once released from the pedestal, the statue could not fall into the bowels of the wreck. Turner was afraid that if he used explosives to blast the statue free from its mount, the detonation would damage the hollow casting. Electric torching was out of the question because of the voltage drop through the length of cable necessary to reach the work area. The job had to be done by hand. Thus came the task of cutting with hacksaws through the legs, and the rear support stanchions that held the bronze statue in place. The divers took turns sawing, sawing, and sawing. They broke several hacksaws in the process, and wore out or snapped all their blades. Turner was forced to run to the Nantucket Lightship for replacements. It was back breaking, arm wrenching work-but not a job they were about to give up. No one remembers how many dives it took to accomplish the task, but they all breathed a sigh of relief when the last cut was made and the statue swung free of the alcove. They left only the feet behind, having severed the statue above the ankles. Turner brought the Top Cat into position, retrieved his divers, and brought the descent line over the bow and hauled on the rope until the thinner line, fastening the liftbag to the Andrea Doria's lifeboat davit, snapped. As the statue sprang upward, the capstan took in the slack. The air in the liftbag expanded at a prodigious rate, accelerating the ascent. When the liftbag leaped out of the water, the air dumped out of the open bottom. The statue swung like a pendulum to a position below the boat. The crane hoisted it onto the deck of the Top Cat. After eight years of darkness, the Admiral almost winced in the glare of the sun. What is told in a few short sentences required eight days of effort, and the expertise of seasoned divers-to say nothing of the financial backing of two men who not only had a dream, but had the strength of mind to make it come true. For a while, the statue was the highlight of the National Social Club, on Union Street in New Bedford. When the Top Cat left for her new work station she took the statue with her: a monument standing on the afterdeck where all comers could see it. Since Glenn Garvin had purchased the Sea Garden Hotel in Pompano Beach, Florida. He had a special platform built for the statue in a second floor banquet hall that seated four hundred people. Two flights of stairs led patrons past either side of the magnificent bronze Admiral; they could not fail to see and appreciate it. Garvin called the banquet hall the Andrea Doria room. The hotel was losing business and could not remain viable. 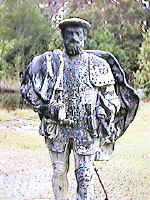 The statue was transferred to Capt. Dan Turner. It made a few voyages on the boat, then a conversation piece in a Fernandina Beach Bar and finally ending up as a lawn ornament. 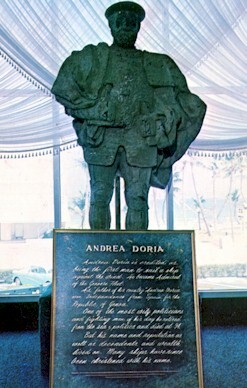 In the 1990's John Moyer was granted salvage rights to the Andrea Doria and one of his expeditions recovered the pedestal and feet of the bronze statue. The two separate pieces have yet to be reunited as the statue itself is on the lawn of Captain Dan Turner, owner of the Topcat dive boat. It is my sincere wish that these two pieces can be once again united and displayed in a museum where it belongs, to remember those that perished. What a long, strange trip it's been for Adm. Andrea Doria. A bronze statue of the 16th century Italian seafarer that sank in 1956 while on board the luxury liner that bore his name will be returned to Italy soon -- after quietly spending the past quarter-century in a Fernandina Beach saloon and on a nearby lawn. Artisan Gary Knappenberger will restore a bronze statue of Italian Adm. Andrea Doria. Knappenberger is a friend of the statue's owner, salvage ship captain Dan Turner, and will do the work at Robert Shinall Services. When the MV Stockholm carved a fatal gash in the bow of the Andrea Doria on July 25, 1956, the admiral's 101st trans-Atlantic voyage ended with him sleeping at the bottom of the ocean 11 hours later. Hauled to the surface minus its feet by salvagers in 1964, the statue was displayed in a Massachusetts social club, its salvager's ship and a South Florida hotel before its dry-docking in Northeast Florida. Now the admiral will cross the Atlantic again for a scheduled June exhibition in a museum in Genoa, Italy, after restoration at a Jacksonville marine and industrial repair shop. Artisan Gary Knappenberger is a friend of the statue's owner, salvage ship captain Dan Turner, and will do the work at Robert Shinall Services. Because the statue's original feet and base, which were recovered in 1996, won't be reunited with the rest of the statue, he is happy to design a new metal pair. Anthony Grillo, 3 when his mother dropped him into a lifeboat next to the sinking ocean liner, is pleased the admiral will get his sea legs again. He is Webmaster of an Andrea Doria survivors' Internet site. "Adm. Andrea Doria's statue is the soul of the ship for a lot of survivors. It broke their hearts that it was sitting out in the elements, and finally, it will be restored," Grillo said. "I know the feet were recovered, but I don't know if that [reuniting statue with them] will ever happen. But restoring the feet and exhibiting the statue in a museum would be the best that could happen." The Andrea Doria was launched in 1952, its first class lounge displaying the admiral's statue dressed in armor and flowing cape, his right hand resting on the hilt of a long sword in front of a 1,600-foot mural. The luxury liner was headed to New York when the Stockholm hit just below the bridge. Eleven hours later, the Italian ship slipped under the waves, 46 of its 1,706 passengers and crew dead, along with five from the Stockholm. Within days, divers were on the wreck, on its side 290 feet down. 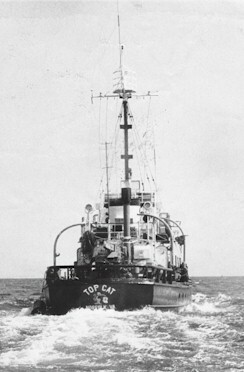 In 1964, Turner piloted the Top Cat to the site with salvagers Glenn Garvin and Robert Solomon. Blasting bulkheads, they ultimately hack sawed the admiral from his feet and base over eight days. "Shortly after they brought him up, they tied him to what looks like the muffler of his dive boat," Knappenberger said. The statue was displayed in a social club in New Bedford, Mass., then on Top Cat's aft deck. When Garvin bought the Sea Garden Hotel in Pompano Beach, it went up near the aptly named Andrea Doria Room, where someone stole its sword. 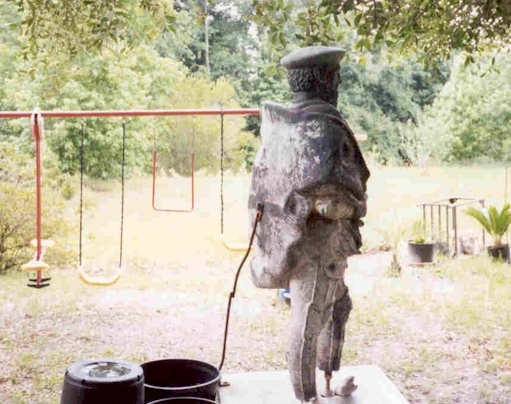 The statue was given to Turner about 25 years ago and put in the Palace Saloon in Fernandina Beach before sneakers, then cowboy boots, were added to its legs and it was displayed on his lawn. Now the 5-foot-tall statue stands in Knappenberger's shop, which hugs the railroad tracks along Roosevelt Boulevard, near equipment used to make lighthouse lenses and supports and other marine work. Using photographs of the original feet salvaged by John Moyer and displayed in New Jersey, Knappenberger carved wooden feet to match what used to sit south of the stubs. Molds of the wooden bucks will be filled with molten metal, then the new feet will be added plus a new sword blade to replace the original. After the white deposits from its eight years underwater are shell-blasted off, the newly polished statue should be on its way to Italy by May. Because the statue's original feet were removed, Knappenberger will design a new metal pair. "I love any kind of restoration, and this is just another great highlight. The history of the man himself was unique," he said. Andrea Doria historian David Bright, who has made 120 dives on the wreck and recovered lifeboats, deck chairs, porcelain china and other artifacts for displays at the Nantucket Lifesaving Museum and two traveling exhibits, said he had been trying to find and buy the statue for years. "If it is going overseas, I am glad it is to an educational institute, so it is on public display for education," he said. "What always bothered me is that people had these wonderful treasures and didn't share them with the public." Turner, now a truck driver, was on the road and couldn't be reached for comment. � 1952 -- Artist Baganini Fiume designs the bronze statue. � 1956 -- The Andrea Doria and its namesake statue sink off Cape Cod, 11 hours after it is struck a mortal blow by the MV Stockholm. � 1964 -- Salvagers Glenn Garvin and Robert Solomon retrieve the statue, minus its feet, from the sunken ship 290 feet underwater. � 1964 to the late 1970s -- The statue is displayed at a social club in New Bedford, Mass. � Late 1970s through 2004 -- The statue is displayed in Fernandina Beach's Palace Saloon and in the nearby home of salvage ship captain Dan Turner. � 2004 -- The statue is sent to Robert Shinall Services in west Jacksonville for a new foot fitting before it is sent to its new home in Genoa, Italy. Send mail to webmaster@andreadoria.org with technical questions or comments about this web site. Send mail to agrillo@andreadoria.org to contact Anthony Grillo about the contents of the web site.